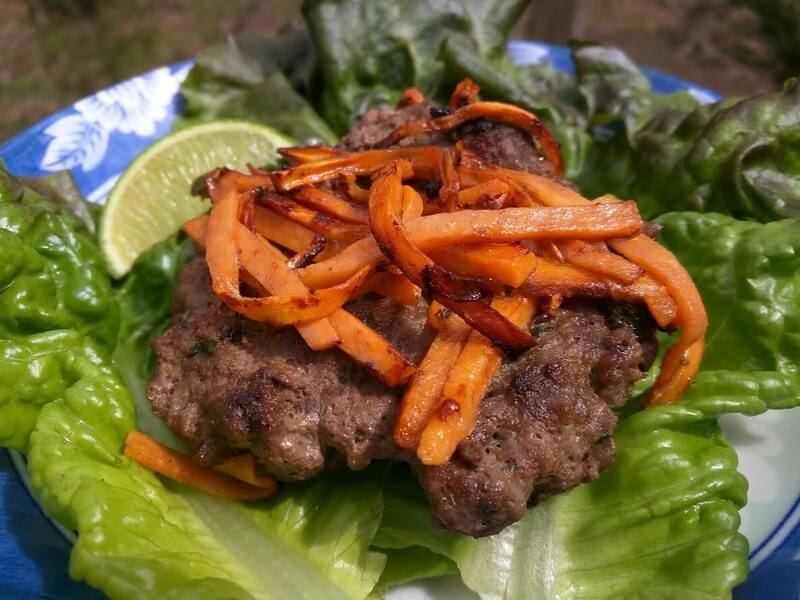 Lean beef sliders crusted with shredded sweet potatoes make for a versatile gluten free, low cost and diabetes friendly entrée. Mix together ground beef, salt, black pepper, 1/2 teaspoon garlic powder and 1 tablespoon fresh chopped basil. Divide seasoned beef into 4 even sliders. Press each slider into the sweet potato strips, pressing firmly to ensure each side is coated and sweet potato adheres well. Heat a large sauté pan over medium heat. Cook sliders for 5 minutes on each side, until sweet potatoes are golden brown and sliders are cooked through. While sliders are cooking, make the basil mayo. Mix together 2 tablespoons fresh chopped basil, 1/4 teaspoon garlic powder, 1/4 cup low fat mayonnaise and the juice and zest of 1 lime. Serve sliders hot with the basil mayo and any other slider toppings including lime wedges, lettuce, sliced tomatoes and sliced onions. You can substitute 1 teaspoon of dried basil for the 1 tablespoon of fresh basil.